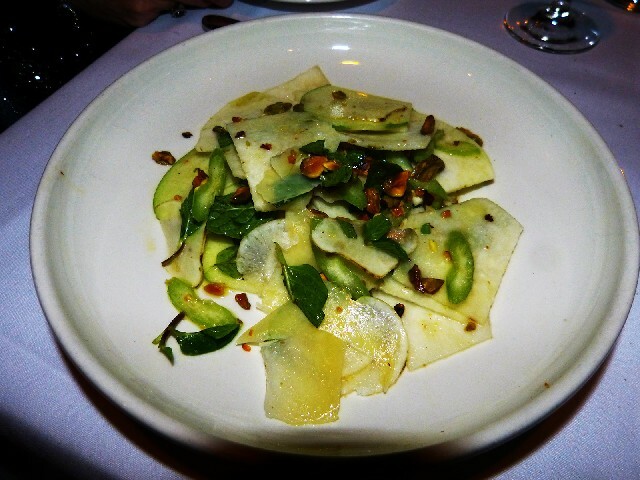 The first course of greens on the Moroccan menu. 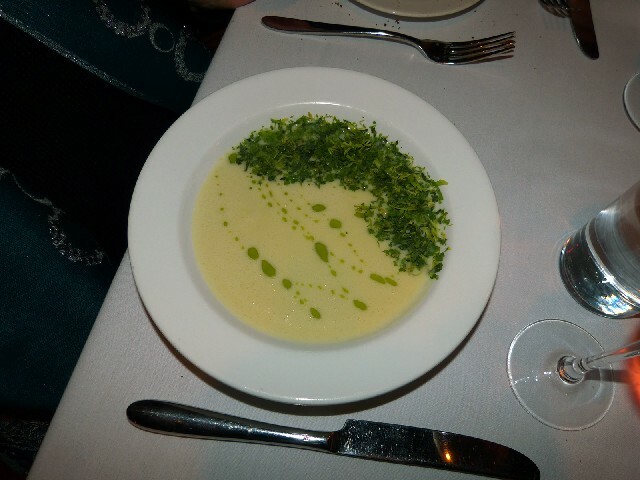 Potato and fennel soup was nicely garnished. The kohlrabi salad was surprisingly abundant. There were sparse ingredients in the oyster stew. A veal based Moroccan main dish with little evidence of protein. It was snowing, what else is new, last night on our way to the upscale Mezze in Williamstown. 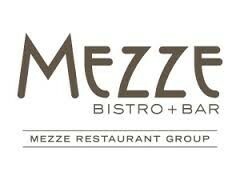 During the off season, a tough time for Berkshires restaurants, Mezze features a weekly Comfort Sundays special. 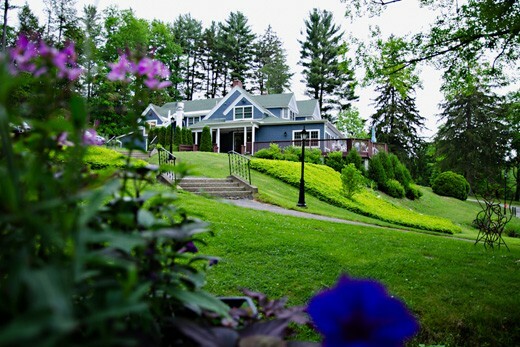 The restaurant is known for fresh ingredients including locally sourced meat and dairy products. Each week we get an e mail blast with the featured menu. An evening of Moroccan food, appetizer, entree and desert for $29 dollars was particularly enticing. We asked friends to join us for a festive gourmet experience. Mezze takes its name from small plates of food, think tapas, served with drinks at a bar or bistro. While charged with flavor the term mezze proved to be too literal. 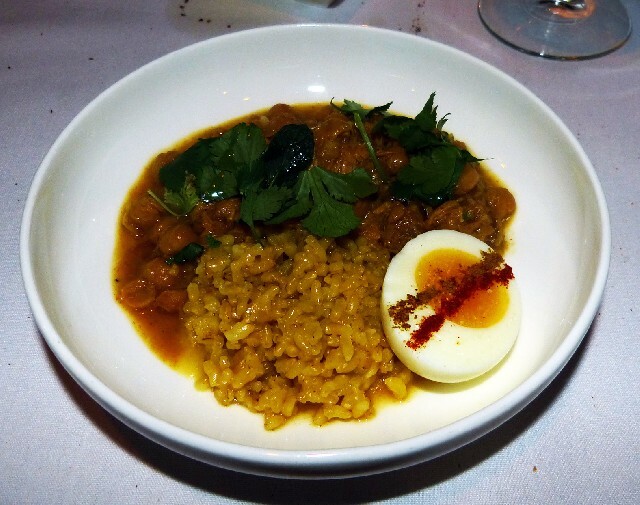 As is too often the case with ambitious restaurants big prices result in small portions. The maxim of "leave them hungry" is better applied to theatre than restaurants. Not to imply that we are cheap but there needs to be a balance between quantity and quality. Apparently, in season, Mezze attracts vacationing New Yorkers who don't flinch at small pours of expensive wines and skimpy plates of food. The Sunday night menus, however, are intended to entice locals of more modest means but with refined palates. The marketing strategy is to enjoy a Comfort Sunday then return in season. The plan was to enjoy the Moroccan menu but there were complications. There were no real options for the vegetarian at our table. She ended up with a soup and salad combination which she much enjoyed. But the menu did not have a single dish designed for vegetarians and containing some form of protein. During table conversation she described visiting upscale restaurants and being served a tossed together plate of unexciting steamed vegetables for $30 or more. You don't have that problem at Indian and Chinese restaurants. Our superb server understood and said that she would pass the information along at the next staff meeting. Later she provided a comment card for more details. She was also well informed when we asked for the ingredients for the Moroccan dishes which were so spicy they blew the wax out of my ears. It was a new menu which she hadn't tried but produced copious notes. It was the level of attention to detail that one associates with fine dining. How refreshing not to be at the mercy of some twenty something, aspiring actress with attitude. Our server was a seasoned and courteous professional. Three of us opted for the Moroccan special. Given that the owner, Nancy Thomas, is Moroccan American the food was authentic tasting. Perhaps too much so. 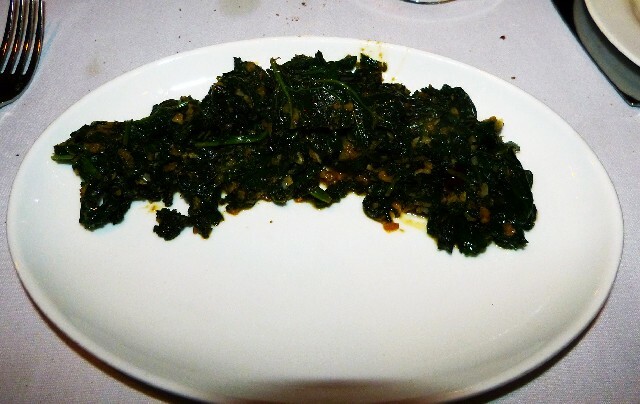 The first course was a generous serving of greens ($7) with a pantry full of spices. While wiping away tears of joy/ pain we struggled to identify the exotic ingredients. A couple of bites overwhelmed my wife. Spicy food doesn't agree with her and this was the food equivalent of an encounter with Hulk Hogan. She asked for the menu and plan B which resulted in that miniscule but tasty oyster entree. 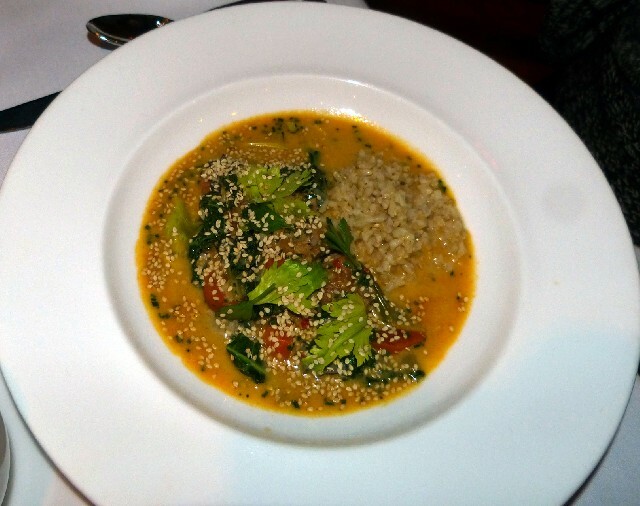 The Moroccan main dish ($15) was a small bowl of what was described as a veal stew. We never found evidence of protein other than the flavor of broth with chick peas. A spicy condiment was served on the side. While enjoyable the dish seemed to be over before you got started. Our friends finished with the crepe for desert ($8.50 a la carte but $7 in the combo). They much enjoyed it but we are avoiding gluten and refined sugar. Apparently it was sinfully delicious. Oh well. Then we discussed our experience. B I had the Moroccan dinner and both dishes were nicely balanced and flavored. The entree was a little slight. I would have liked more veal or whatever was in the main dish. C I didn't see much evidence of protein. The dish was mostly chic peas and rice. B It was a veal stew. A The same for me with the oyster stew. There were two little oysters and one and a half pieces of duck sausage. Rice and a very nice flavored soup. There were ten bites of stew. I really wouldn't call that a dish. It was tasty and well done. P The potato and fennel soup was excellent. It was fine. I probably had more on my plate with the kohlrabi salad than any of you had. I liked it but it got a bit tedious. I could have had less and you could have had more. B The ambiance is a little off. It could be more interesting. It seems so plain in here. The windows are nice. They are trying to be sophisticated but I find it a little boring. P The service was fine. C I find the room noisy and it's not at full capacity. There is a lot of flat wall so the sound bounces and is amplified. Even though we are on the outside at a corner window table. Something could be done to adjust the acoustics. Waitress Are you ready for desert. A I'm going to look because I haven't had much to eat. C (asking the server) Do you have spaghetti and meat balls? With a bit of gravy. A (to the server) By the way I tasted the Moroccan entree and it was not too spicy (like the appetizer). The heat was on the side as a condiment. W The appetizer ingredients included greens, garlic, cumin, paprika, olives, coriander, preserved lemon. The (entree) has veal shank, thyme, ginger, garlic, paprika, cayenne pepper and on the side chili. For Comfort Sunday this is our first ever Moroccan night and people like it. We're super busy tonight. We try to come up with different menus. It will be interesting to see what the chef comes up with in weeks ahead. "Went to Mezze once...highly overrated." "mmm mezze sounds middle eastern"